Enjoyed the erudite stuff about Defence policy in the latest brief. And I'd always thought that the role of the RAF was to protect the Royal Navy while it was evacuating the Army! Seeing Phil Clarke’s article this weekend with reference to ‘The Nizam’ rang a bell. I’d seen something recently relating to it and sure enough in April’s issue of ‘Sandscript’ the Mauripur newsletter, there was a memory from one of our members who was an aircrew pilot stationed at Mauripur 1947 to 49. ‘Quote’ One of his duties was to fly the Nizam’s adviser, Sir Walter Monkton, from Hyderabad to Delhi. They were given a choice of staying in the palace or an hotel in the city. They would choose to stay in the hotel which gave them more freedom and they were given a telephone number to use if they wanted anything, and this did mean anything. On one occasion they asked for a car which duly arrived, a Rolls Royce with a large crest on the front complete with chauffeur. The crest acted like magic; Hyderabad at that time was built on a grid system with wide and clean streets. At each intersection there was a policeman directing traffic, and the car being visible for at least a couple of blocks they never had to stop. Evidence of the Nizam’s benevolence was everywhere, with modern public transport Leyland buses, schools and hospitals. One of my favorite hostelries here in Shrewsbury is a pub called ‘The Romping Cat’ and I took them a photo from another issue of that newsletter of the pub our lads had created at Jiwani, which was an emergency landing strip on the Iranian border just up the coast from Mauripur. The pub was called ‘The Pharting Cat’ with the pub sign clearly hanging outside the building, quite a novelty which they even got away with during the AOC’s annual inspection. Beer glasses were manufactured by standing a beer bottle in a metal container and pouring a measure of oil in the container then pouring a similar measure of water into the bottle. By inserting a red hot poker through the neck of the bottle, a clean break would occur at the liquid level about 5” up from the base of the bottle and ‘Hey Presto’ you had your glass! I saw similar glasses on the mess tables at Sharjah, but they were filled with rancid butter! I only became part of the UKMAMS OBA some 4 weeks ago, I had noted your bio. I have had the same photo on hand ready to update and pass to Tony. I know more than a few of these people and will advise. I think our paths only crossed at Kidbrooke Jul./Aug. '62 You will find me in the middle row 3rd from left. I have been a Freight Forwarder for 27 years. Life's journey has brought me to Canada and Alberta where we have been for some 20 years. My company is called 'GBH' all because of 6 weeks in Kidbrooke !!! I look forward to ongoing contact. Interesting to see Dave Barton’s photo of Kidbrooke 1962. I have a similar one taken in 1961 which contains a couple of the same training staff. I will send it when I get a scanner. Like Dave I also served at JSCBC London. I must have arrived after he left as I was there 1963-1966 after I returned from Aden. I did come across Sgt John Jennings and SAC Jim Macintosh. JSCBC was a funny little unit comprising of about 6 RAF Air Movers and About 20 Army bods. We used to deal with the documentation of Forces travelling to Germany on civilian air trooping flights from Manchester and Gatwick. 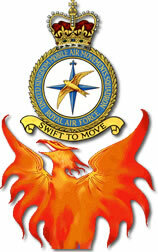 There was also a small RAF Surface Movements Unit based there. We used to work office hours and travel to and from work in civvies. It was just like being a city gent; a slight change from the heat and hurly-burly of Khormaksar from whence I had come. On my one and only visit so far I could not find any mention of MAMS. Yes I was aware of that site - it used to be a HUGE site - but unfortunately they had to close a major portion of it. OBA member John Belcher wrote an article in there about the Gulf War - and MAMS - I forget what it's called, but it's very similar to the one I put on the OBA site (FILO). I have spent most of the day rearranging my furniture - found all kinds of dust bunnies to chase away! Now I am just relaxing - flying a C130 (XV292) from St. Mawgan to Lyneham in Flight Simulator 2002. It's a marvellous program, and I plan on digging out my log books and repeating a lot of my flights from 30 odd years ago. There's so much in these programs nowadays, other aircraft flying around the skies and Air Traffic Control to keep it all in order - 'fraid I'm hooked on it! Well, enjoy your Sunday mate. Had another look at that site, found John's article and yes, it is very similar to yours. I have also got Flight Simulator 2002, but at the moment I am keeping to the Cessna. I can get the bloody thing off the ground, just, then I lose all control and crash. It wont beat me, I'll stick with it and maybe one day will progress to the Herc and other a/c. With the technology around these days, wouldn't it be great if someone would make some software so that not only do you fly the a/c but also load it, do the trim sheet etc., then fly to various destinations to offload and reload? Talking of loading a/c, can you recall a Belfast at Brize being tipped on it's tail? As far as I can remember it happened when I was out in Cyprus, sometime between 72 and 74.Or have I been dreaming? or getting mixed up with the VC 10 that went on to it's tail, when some fitter forgot about the fuel in the tail tanks? I will always remember in Cyprus I nearly did it myself with the weekly run of frozen food to Salalah (or somewhere out that way, the old memory is going). It was always a very rush job to load the Herc from 70 Sqn when the container arrived at cargo in the early hours of the morning. Transferred it to the condec, out to the awaiting a/c, with the crew as always panicking that they not will get away on time (but they always did). Any use for your humour pages? THE Ministry of Defence confirmed yesterday it is in talks on plans which will see budget airlines jetting into RAF Leuchars military air base, carrying tourists heading for a round of golf at St Andrews. Dublin-based Ryanair has revealed it is one of the airlines in discussions with the MoD, but it is understood that a number of other carriers have expressed an interest in providing services to and from the base. A spokesman for the MoD told The Scotsman: "Strike Command has done a feasibility study of the commercial potential [of RAF bases], and we’re looking to see how spare capacity can be used by allowing civilian contractors to land at certain airfields." He added: "RAF Leuchars has identified some "irreducible spare capacity", and it definitely has the capability to accept commercial aircraft because it is an airbase with a large airfield." The spokesman said it would be "inappropriate to name the companies involved," but added: "we’re aware of significant interest from industry." Ryanair said: "Talks are in the very early stages and we couldn’t put a timeframe on them." The Irish airline is known to be anxious to add another Scottish hub to its network, after talks with Inverness terminal operator Highland and Islands Airports broke down last week. Fife Council has also been approached by the MoD. After preliminary discussions during the past months, the two parties have agreed to meet in six weeks’ time to discuss the proposals in greater detail. The Council has been invited to provide recommendations on the scheme, which is expected to require significant investment in local transport links, as well as on the air base. Speaking yesterday, Fife Council head Jim Findlay said: "Obviously it would be a tremendous boost for Fife in terms of attracting more tourists into Scotland." He added that the job of building the facilities necessary for thousands of commercial travellers "will be a huge task", but pointed out that the airfield is already being upgraded in preparation for the arrival of a squadron of Eurofighters next year. The prospect of military strike aircraft landing alongside commercial airplanes will raise many security and safety concerns. The MoD insisted it was well aware of those dangers. The spokesman said: "There’s got to be a balance between what we can allow commercial users to do and our own requirements." He added: "We have to make a decision about what is feasible within the remit of having a base within what is primarily a military airfield." The spokesman said the use of RAF Leuchars as a commercial destination would not be unique among air force facilities, as RAF Northolt is already used by civilian airlines. However, the volume of passenger traffic passing through RAF Northolt, largely restricted to high profile celebrities and politicians, is considerably less than the numbers of passengers Ryanair and other operators are likely to carry. More than 1.3 million travellers passed through Scottish airports last month, and even a fraction of that number threatens to overwhelm local transport links. The MOD said it had initiated discussions with local transport authorities, and Fife Council’s Findlay said the environmental impact of such operations, and the support services necessary, need to be carefully considered. Comments: Popped in to see if I could spot a pal (Hiya Gary) couldn't leave once I spotted the photo's, while looking I think I must have fell in love about 589,900 times. What girl wouldn't? You are all true Hero's! I found it hard to hold back the tears though when reading about the deaths & suicides. I am very sorry especially when all I can offer is a few words in the way of a BIG THANK YOU for years of unconditional protection. Rumour has it that Spider Jolley and Dibs Loveridge are getting together over 180 litres of imported French plonk the weekend of the 25th at a campground somewhere in North Yorks..... that's only a rumour though and you didn't hear it from me! Well, the bombs are obviously dummies, dare I say the personnel carrying them are d-------- as well? No I did not mean that, honestly. But why should they pose for this photo? I have not got a clue, but sorry about above, couldn't resist the temptation. Going to our 40th reunion this weekend, that is the 46th Entry out of Hereford, who signed up on 16th May 1962. Will report back after the do. This is scary and somebody stole my thunder. I've had the same photo in my scanner for about two weeks waiting to find out how to use it !!!! New on the site this week? Well, there is a new Mystery photograph that was just put up - but I guess it's not a Mystery anymore - we'll just call it a "Curiosity" photograph. Thanks to Ian Berry there are 4 more photographs in Images 2000 that are worth a shuftee.